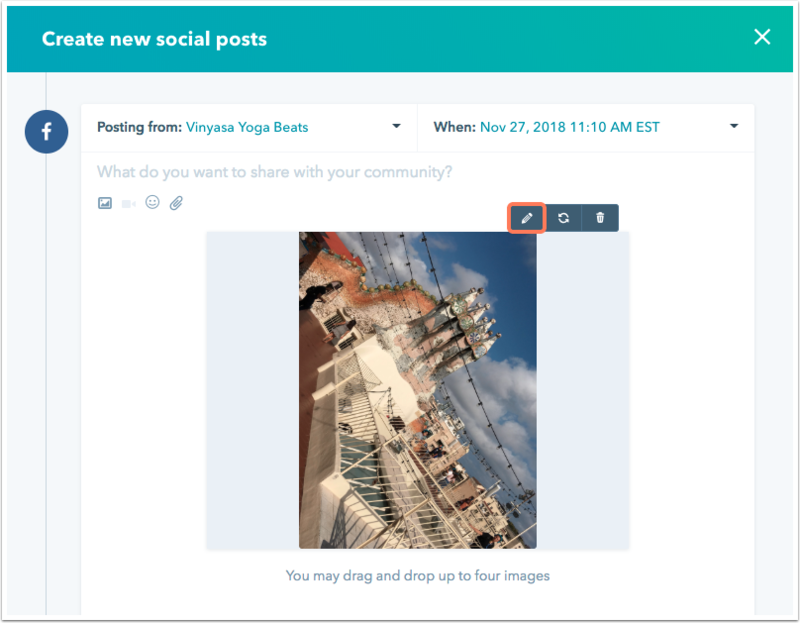 With the HubSpot image editor, you can crop or resize an image to better fit your content or social media post. You can also decrease the size of your image to improve image load times for your page, blog, or email. The image editor is available in rich text modules, the file manager tool, and the social composer. Please note: images on HubSpot's responsive pages or emails will scale to fit the width of the module on your page or email. One exception where you may want a larger high-resolution image is for a larger background image. In the social composer, hover over an image in your social post and click the pencil icon edit that appears. In the file manager dashboard, click on an image to open the sidebar editor pane. Then click Clone and edit to open the image editor. In a rich text module, click the image icon insertImage in the rich text toolbar. In the right pane, hover over the image you want to edit and click the information icon info that appears. Click Clone and edit to open the image editor. Enter the width and height for your image in pixels. Click and drag the corners or side edges of your image to adjust its height, width, or scale. Click the rotate icon rotate to adjust your image 45 degrees clockwise. To optimize your image for a social media post, click the Custom dropdown menu and select Facebook, Instagram (Square, Portrait, or Landscape), LinkedIn, or Twitter. After you've made your edits, click Save clone.